There are some authors who just pull me in with their colorful words and interesting storylines. It is normally hard for me to get into mystery books but when I read the first Tyora Moody book, I was hooked. Her book, Oven Baked Secrets is about Eugeena Patterson, a retired school teacher who with her friend Louise Hopkins were like the neighborhood watch team. Whatever happened in their little corner called Sugar Creek did not easily get past them. Unfortunately, Louise son decided to put her in a nursing home, and that doesn't sit well with Eugeena. There is a lot of drama in Sugar Creek, people disappearing, a blossoming romance, an unknown visitor, and a murder. In addition, Eugeena haven't been allowed to visit her dear friend. There is no way Eugeena is going to ignore what's happening, plus she misses her friend. When your friend is down, who's the best person to find out what is going on? In this case, it's the nosey neighborhood watch keeper Eugeena Patterson. I enjoyed this story and found the book hard to put down. Tyora Moody has written a witty and interesting read. You'll be intrigued with Eugeena and the host of characters who are working to solve this mystery. 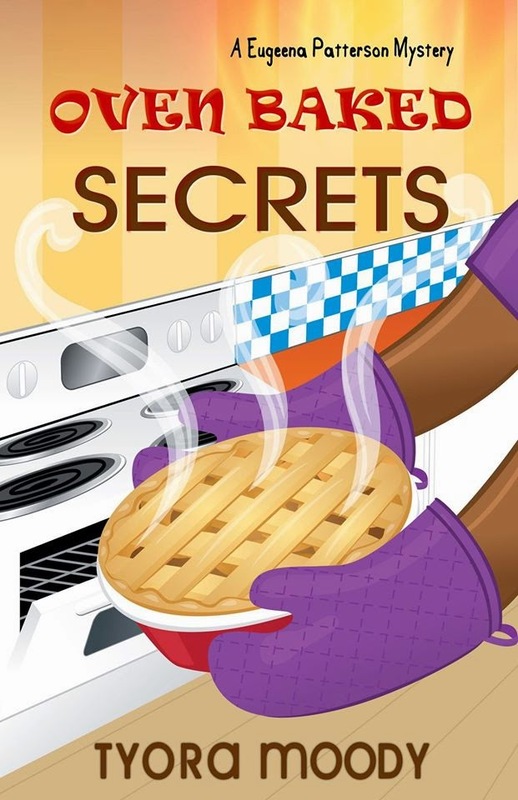 I enjoyed reading Oven Baked Secrets, the second book in the Eugeena Patterson Mysteries. I look forward to reading more from this author.